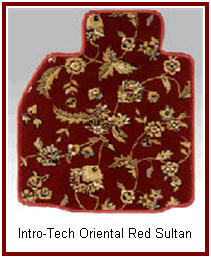 Oriental Auto Floormats Bring Visions of the Orient to Your Driving Experience. Ah, Auto Floormats Oriental! It sounds like some entrée you’d get at a Sushi Bar for Cars. But, no, these are Oriental Auto Floormats made by Intro-Tech with a decidedly Oriental graphic scheme to them. Note: You may also find these Oriental Car Floormats at Designer Mat International (DMI) as DMI has acquired the manufacturing and distribution duties for these car mats from IntroTech. The Oriental Mats are especially nice in a convertible or any other personal transportation vehicle with a visible interior. That way everyone could see the car mats. These mats are made of extra plush 114 oz. polypropylene carpeting that’s stain resistant and long wearing. They are double serged around the edges to prevent your black belt karate masters from shredding them. A nibbed backing prevents these mats from slipping on your vehicle’s carpet. 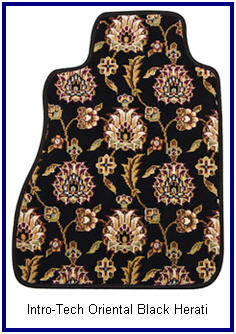 These car mats come in three patterns reminiscent of the mysterious Orient. Warning! You’ll have an uncontrollable urge to see the Great Wall of China if you buy a pair of these mats. You can prevent a lot of dirt, stain and moisture problems with your Oriental Floor Mats by using universal absorbent car floor mat protectors. These mats will soak up spills, excess water and mud off your nice colorful oriental mats and reduce mold and mildew smells. If your oriental design mats do get dirty and smelly here's what to do to solve that problem.